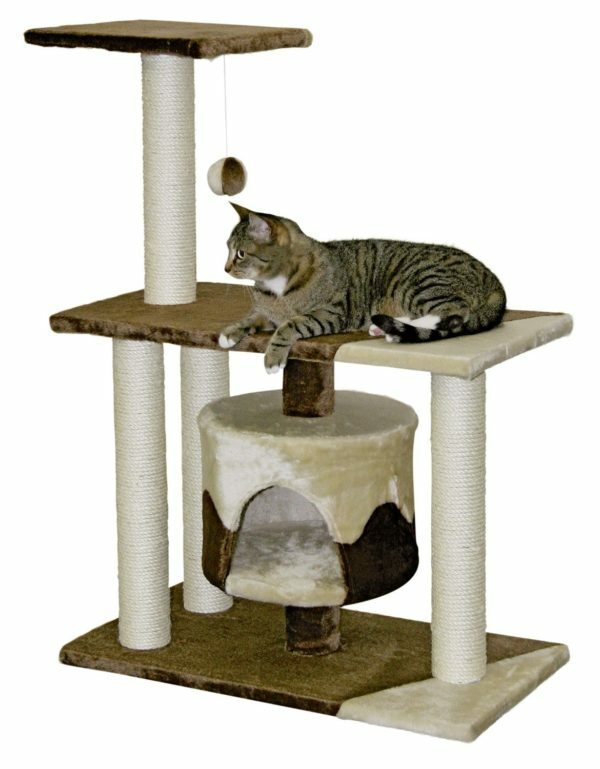 The Nobby Kaduna Plus Cat Play System Tower Tree is a complete entertaining space for your feline friend. No matter how adventurous your kitties feeling, that they can either kick back and relax. Or, scratch themselves silly on one of several sisal wrapped scratching areas included.. The base level scratching barrel provides a cosy and relaxing getaway for your feline friend to escape to when the stresses of being a modern day pussycat gets all too much. Yes, being waited on hand and foot can sometimes wear you out, which is why this cat tree has included two cosy cubbyholes for maximum relaxation. They can poke there little whiskers outside the holes or try and catch one of the dangling playing balls with a freshly sharpened claws. If all this gets exciting for them then they can try and conquer the height of this cat tree where there is a plush cosy platform awaiting them. All of Nobby cat products are expertly made to the very highest possible standards so you know that you’re investing in a quality product that will stand the test of time for many years to come.